Scientists used a variety of tools originally developed for medicine, manufacturing and geology to discover hidden details in the artist’s paintings and sculptures. That was not surprising. X-ray images taken a quarter- century ago had shown that Picasso had painted this work, known in English as “The Crouching Woman,” over another artist’s landscape. Sandra Webster-Cook, a conservator of paintings at the Art Gallery of Ontario in Toronto, which owns the painting, also observed textures of the brush strokes that seemed neither to reflect Picasso’s composition nor the underlying landscape. “It was clear there was something else going on underneath,” Ms. Webster-Cook said. The Ontario staff reached out to experts at the National Gallery of Art, Northwestern University and the Art Institute of Chicago. Using tools originally developed for medicine, manufacturing and geology, the researchers peered through the canvas without damaging it. They saw how Picasso had incorporated the contours of hills from the earlier painter’s landscape into the curves of the woman’s back. “Kind of a jazz riff back and forth,” said Marc Walton, a research professor of materials science and engineering at Northwestern. The analysis also uncovered Picasso’s repeated efforts to paint the woman’s right arm. He ultimately abandoned that part of the composition, covering it with a cloak. “So this again is getting into the mind of the artist and understanding his creative process,” Dr. Walton said. The findings were presented Saturday at a meeting of the American Association for the Advancement of Science in Austin, Texas. At the meeting, researchers also presented new insights into Picasso’s bronze sculptures based on an analysis of the alloys. “We’re really opening a new era of inquiry in the way these iconic works of art were made,” said Francesca Casadio, executive director of conservation and science at the Art Institute of Chicago. Dr. Casadio and Dr. Walton are directors of the Center for Scientific Studies in the Arts, a collaboration between the university and the art institute to apply technology to art history. Three years ago, Ms. Webster-Cook and Kenneth Brummel, the Ontario museum’s assistant curator of modern art, attended a conference in Barcelona about the scientific analysis of other Blue Period paintings. One of the scientists Ms. Webster-Cook met there was John K. Delaney, a senior imaging scientist at the National Gallery of Art in Washington. Dr. Delaney later went to Ontario to examine “La Miséreuse accroupie” using a technique that records the brightness of reflected light across a swath of the visible and infrared spectrum of light. Various molecules absorb certain colors of light. The technique, called reflectance hyperspectral imaging, allows scientists to identify minerals based on patterns of dark lines in the spectrum. It is the same technique that NASA’s Mars Reconnaissance Orbiter uses to figure out the makeup of Martian rocks from orbit. Dr. Delaney’s images revealed the hidden right arm. Scientists from the Center for Scientific Studies in the Arts then viewed the painting, using a portable instrument that bathed the canvas with X-rays, some of which were absorbed by elements in the painting’s pigments, then re-emitted. Different elements in the pigments radiate at different wavelengths. Maps of the iron and chromium in the painting — Prussian blue is an iron-based pigment and chromium is used in yellow pigment — largely matched the structure of the current painting. But the patterns of cadmium, used for an array of yellows, oranges and reds, and lead, for a white pigment, showed a different painting, adding detail about the right arm and hand. Mr. Brummel said the hidden arm is similar to that of a woman in a Picasso watercolor that was also painted in 1902. Mr. Brummel said he had made progress in identifying the original landscape artist. And he determined the scene depicted — the Labyrinth Park of Horta in Barcelona. None of the new findings would have been possible without the scans, he said. “These scientific instruments and these collaborations with chemists and with imaging scientists are making transformational contributions to the discipline of art history,” Mr. Brummel said. 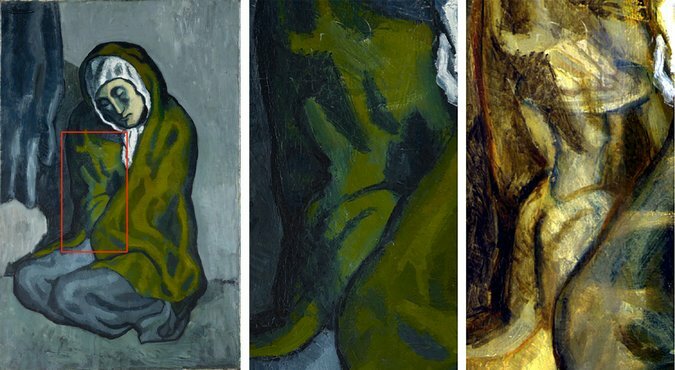 The scientists at Northwestern and the Art Institute used the same X-ray technique to examine 39 of Picasso’s bronze sculptures, cast between 1905 and 1959, and 11 painted sheet metal sculptures from the 1960s, all from the collection of the Musée Picasso in Paris. Over the past decade, the researchers have analyzed about 350 bronze sculptures from the late 1800s to the middle of the 20th century made by different artists in Paris. The composition of the bronze alloys provides clues about where and when the sculptures were cast. For example, the researchers were able to figure out that the foundry of Émile Robecchi in Paris produced five of Picasso’s World War II-era bronzes that lacked an identifying stamp. The composition of the alloys used by the Robecchi foundry in 1941 and 1942 varied significantly — some higher in tin, others higher in zinc — possibly reflecting the limited access to metals during the war. “At the same time in Paris, the Germans were forcing private individuals and the French government to basically melt down sculptures in the city to retrieve the metal,” Dr. Casadio said. For a later sheet metal sculpture, “Head of a Woman,” the researchers discovered that Picasso had used silver for the hair, eyes and other facial features, a perplexing choice because he then covered the expensive metal with paint. “We took, I think, 25 additional measurements to just be a hundred percent sure,” Dr. Casadio said. Other scientists are developing other new ways to scan artwork. In a paper published in November in the journal Scientific Reports, researchers at the Georgia Institute of Technology described how they used a form of radar to study a 17th century painting. With a commercial terahertz scanner — industrial uses include detecting flaws in plastics — the researchers examined “Madonna in Preghiera,” by the workshop of Giovanni Battista Salvi, an Italian painter. Terahertz waves — a form of light with wavelengths longer than infrared but shorter than microwaves — pass effortlessly through the pigments but bounce off the boundaries between different layers of paint. Until now, terahertz waves have had limited use in the study of paintings, because the wavelengths are too long to study the thin layers. “All the echoes lie on top of each other,” said David S. Citrin, a professor of electrical and computer engineering at Georgia Tech. Essentially, you cannot measure things smaller than the ruler you’re using. But in this application, Dr. Citrin and his colleagues knew the echoes were bouncing off flat layers. Advanced signal processing techniques originally developed for the petroleum industry allowed them to spot layers just 20 microns thick — less than one-thousandth of an inch. Their technique could allow other art historians to study the stratigraphy of paintings in the same way that seismologists study the structure of underground rock formations. Dr. Walton of Northwestern said he would like to return to “La Miséreuse accroupie” with a terahertz scanner as well.